The health and wellness of our patients is our primary focus at West Elk Clinic Hotchkiss. Providing outstanding care to our patients is our top priority and goal. To achieve this goal, the providers and patients must work together. This team-based concept is the foundation for Patient-Centered Medical Home. Video visits are appropriate for many types of appointments, especially follow-up and minor urgent care. Feel free to request a video visit right here or by calling our office at 872-1400. We look forward to seeing you soon! Have more questions about video visits? Check out our FAQ page or call us for more information. Infant and Children's care for Well Child visits, immunizations, school physicals, and illness care. 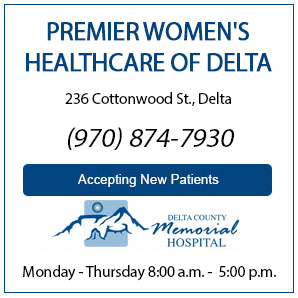 Women's Health and Maternity care, including family planning, prenatal care, delivery at Delta County Memorial Hospital, and postpartum care. Full Adult and Geriatric medical care for both acute and chronic illnesses, including evaluation, counseling, treatment, and referral (if needed) for common emotional disorders. Care Management, Immunizations, Screening, and comprehensive Preventative services for all ages. 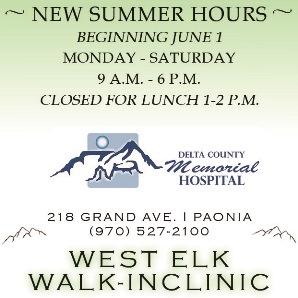 West Elk Walk-In Clinic Paonia and the DCMH Urgent Care in Delta are available for after-hours care.